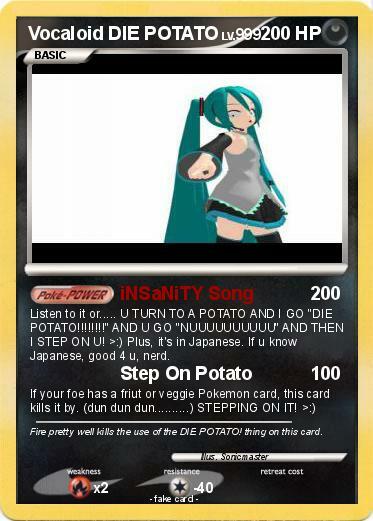 Listen to it or..... U TURN TO A POTATO AND I GO "DIE POTATO!!!!!!!!" AND U GO "NUUUUUUUUUU" AND THEN I STEP ON U! >:) Plus, it's in Japanese. If u know Japanese, good 4 u, nerd. Comments : Fire pretty well kills the use of the DIE POTATO! thing on this card.